The greatest economic challenge facing the United States isn’t illegal immigration; it’s the fiscal and productivity challenges that come from a graying population. 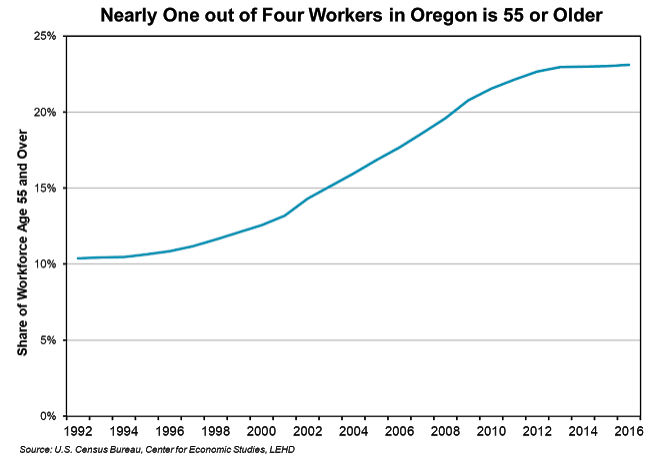 In the case of Oregon, a quarter of our workforce is over the age of 55. We are not on a path to produce that many replacements ten years from now. If only the passions on display this week could be directed toward growing the size of our workforce rather than growing the size of our internment camps, then we’d be solving real problems. Fifty years ago today the number-one best-selling book was Paul Ehrlich’s The Population Bomb. None of its Malthusian predictions came to pass, thanks to productivity-growing market-orientated reforms that have swept the globe since then, but this book inspired a movement committed to reducing our most important economic input: people. Isn’t that the bare essence of left-wing thinking, that people are the problem? Though the world’s population grew steadily, the Ehrlich crowd managed to have some success in the United States. Our fertility rates have come way down, but the negative effects of their misguided goals have been largely mitigated by immigration. While Ehrlich is still taken seriously in radical environmentalist circles, his broader influence today as a thought leader has not fared so well for obvious reasons. The most influential member of his movement, however, is an enterprising disciple by the name of John Tanton. An organizer for Planned Parenthood that was more motivated by the original eugenics vision of Margaret Sanger than today’s feminism, he used the fundraising network of Planned Parenthood board member Sidney Swensrud to create the Federation for American Immigration Reform in 1979 which has church-planted two corresponding anti-immigration organizations: Center for Immigration Studies and NumbersUSA. Together their shoddy research is frequently debunked by free-market think tanks. The misinformation these organizations have spread has helped prevent obvious immigration policy solutions, such as the Ronald Reagan one: if we agree that legal immigration is good, then fixing illegal immigration is easy. All we have to do is stop making a good thing illegal. The folks desperately trying to come to the United States are a blessing, not a curse. America was made great by tired, poor huddling masses yearning to breathe free. So it’s with some irony that a century after Margaret Sanger helped spread fear about Irish and Italian immigrants we see so many descendants of those awesome newcomers believing the same falsehoods about similarly desperate people who possess a similarly bountiful potential to produce wealth. We need to grow our rate of legal immigration now more than ever. 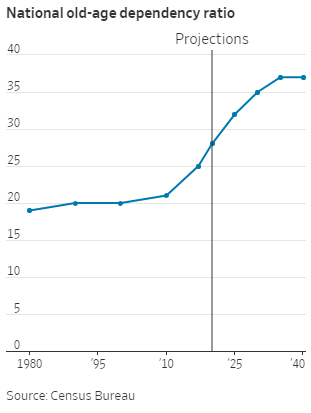 From 1980 to 2010, years that anti-immigration advocates look back at with alarm, the ratio of retiree-aged adults to those of working-age barely budged. Now that’s rapidly changing, according to new census figures released this week. In 1980, there were 19 U.S. adults age 65 and over for every 100 Americans between 18 and 64. 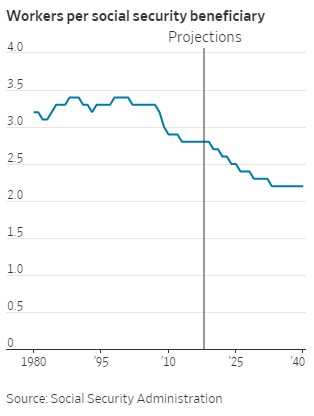 That number—called the old-age dependency ratio—was just 21 retiree-aged Americans for every 100 of working-age as recently as 2010. That would not have been the case if Reagan held Trump’s views on immigration. Since the expansion of legal immigration has been politically curtailed a generation later, our demographic challenges have been reasserting themselves. We’ve seen a rapid shift in the old-age dependency ratio where it’s now 25 Americans 65 and older for every 100 people in their working years. The ratio will climb to 35 retiree-age Americans for every 100 of working age by 2030, and 42 by 2060. Illegal immigration is not aptly described as people cutting in line, because there is no line for them to get in. There is a better way to solve this situation than doubling down on the enforcement of something that, under the law, is nothing more than a class B misdemeanor. The City of Portland would suddenly have to separate a lot of children from their parents too if it were to radically enforce its ridiculous new 20 mph speed limits, where roads that once were legal to drive 35 mph now are not. Many people in Portland are driving at the old, safe velocity, sufficiently high enough over this new speed limit to warrant arrest under reckless driving charges which is a class A misdemeanor and thus legally more serious than entering this country illegally. As a matter of policy, it would never be rational grounds to shrug one’s shoulders and say “well that’s the law, we’ll just have to take these speeders’ children into custody.” The better solution is to let people drive 35 mph. The better immigration policy solution is to broadly grant asylum to these wonderful people, so they are more likely to enter a legal port of entry. Until word gets out that there is actually a line for them to get in, we need only show zero tolerance for the very few among them who actually harm other people. We can simultaneously solve a serious problem like our population decline by no longer creating needless lesser problems with excessively restrictive immigration policy. All we need is a Republican Party that believes in limited government again. I want my party of Reagan back.